Dishonesty is inherent in all suicidefoodist iconography. That is its bedrock. "The animals approve of your intentions," the suicide food proponent purrs. "Actually, the whole thing was their idea all along. You wouldn't want to cause offense by not eating them, would you?" But this takes dishonesty in a brand-new direction and runs with it. The pig is relaxing, enjoying the tropical setting, feeling no pain and having no worries, mon. The bounty of the tropics heaps itself around him. But it's more than that. 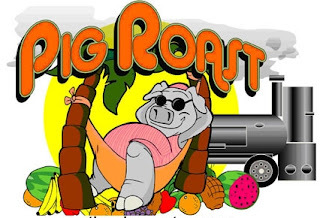 The subliminal suggestion is that this pig is roasting all by himself. The sun is gently warming him. There's no need for us to intervene. This is nature we're talking about. Who are we to question it? Only a mean old crank would have a problem with this. Do you scold the sun for shining? Rail against the snows for freezing? Join the natural order and embrace the consumption of pigs! This is life unfolding, the wondrous spectacle of planet Earth! Deny it no longer! The universe aligns itself to ratify your appetites! Only a fool would turn his back! All of which renders this "After" image, from the same website, as nothing more than the punchline to a sick cosmic joke. Addendum: The style of this logo might indeed look familiar. Other work by its creator has been featured here before. Wow, this site is amazing. I'm flabbergasted. The sad thing is, I've been craving bacon for weeks, but now I wonder where I can get some smoked soy instead? Don't mean I've been eating bacon, just craving it. why not just have some bacon? stupid.